I have previously written about the talented Dayo Ojo, a striker from Sunshine Stars FC of Akure in the southwestern region of Nigeria, and implied that this player could have a bright future in professional football. I recently found out that a player’s agency called “Smartfoot” has included Ojo in their ranks. According to Smartfoot, Dayo Ojo is born 10.10.1994 which would actually mean that Ojo was only 15 years old when he scored goals for Sunshine Stars FC in the Nigeria Premier League. I can document that he scored a goal on 07.07.2010 against Warri Wolves FC in the last round of the 2009-2010 season. However, I have no reason to believe that the date of birth is incorrect and Ojo could quite possibly be one of the most exciting teenagers in Nigerian football. Dayo Ojo first made headlines in the so-called “Super Four 2010”, a season opening tournament between the four top teams of the Nigeria Premier League 2009-2010. Ojo scored a wonderful goal when Sunshine Stars FC won 1-0 against Kano Pillars FC on 06.08.2010. The goal was apparently scored from an almost impossible angle. 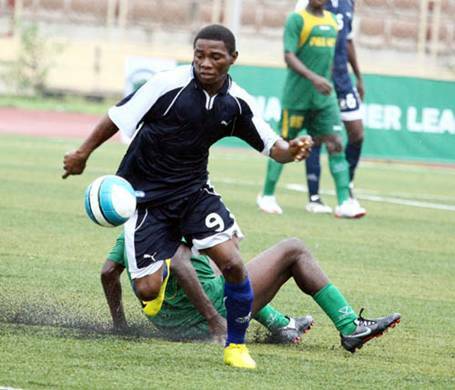 Ojo has also impressed for his club in the Orange CAF Confederations Cup 2011. Sunshine Stars FC knocked out Tiko United FC from Cameroon and Ojo was pointed out as one of the players that impressed. As far as I know, Ojo has not been part of any national football team. However, according to Smartfoot, Ojo has been part of the Nigeria U-17 national football team – which could very well be true. According to Smartfoot, Ojo is 182 centimeters and 76 kilos. His full name is Ekundayo Solomon Ojo. The picture is taken from MTN Football. No matter how good you are, some people will still critizise you………i must say: ekundayo solomon ojo got the talent and what it takes to be a renowed player…..
her zaman her yerde en büyük cimbom. GALATASARAY IS THE BIGGIST CLUB IN TURKEY !!!!! what is a clup u stupid idiot? Galatasaray is the best team in Turkey. Welcome to Galatasaray. Galatasaray is the biggest football Club in Turkey. he is now on trial at Galatasaray S.K.